U.S. Sen. John Cornyn said Friday he would oppose any effort to redirect Hurricane Harvey relief funds to pay for a border wall — a move that he and fellow Republican U.S. Sen. Ted Cruz agreed was unlikely to happen. There were reports Thursday that the Trump administration was considering using some of the $13.9 billion in disaster relief money that Congress approved for Texas and other states to construct Trump's long-sought border barrier. Friday marked the 21st day of a federal government shutdown over Trump's demands for border wall dollars. "I will oppose any reprogramming of Harvey disaster funds," Cornyn told reporters after a joint appearance with Cruz in Austin. "We worked very hard to make sure that the victims of Hurricane Harvey — their concerns are addressed and Texas is able to rebuild. And I think we are all together on that." Cruz, who spoke with reporters alongside Cornyn, said he did not believe the Trump administration "is going to do anything to reduce the funding for Hurricane Harvey relief." Cornyn said he agreed. "I think some of these reports are overstated," Cruz said. "I don't think we're going to see that money jeopardized in any way." 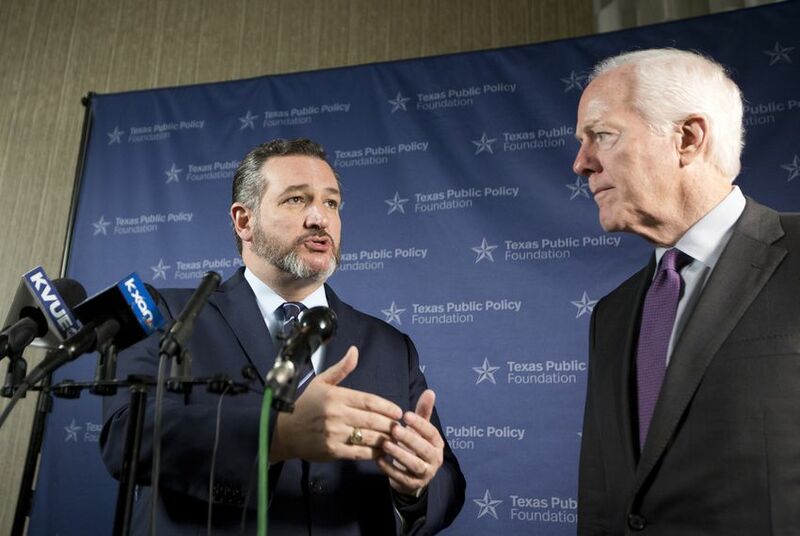 Cruz and Cornyn appeared together at the Texas Public Policy Foundation's 2019 Policy Orientation a day after joining Trump for a visit to McAllen, where he continued to make the case for a border wall amid the shutdown.